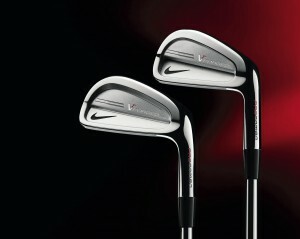 I’ve always thought Nike Golf’s VR Pro Combo irons, introduced in 2010, were the best irons the company has ever produced. Now Nike Golf is attempting to top itself with the new VR Forged Pro Combo irons, which it says is designed to deliver higher ball trajectory, forgiveness, and enhanced sound and feel. The VR Forged Pro Combo set (3-PW) will be available Nov. 1 at a suggested retail price of $999.99. Like its predecessor, the VR Forged Pro Combo is a progressive set designed for the better players. The VR Forged Pro Combo irons feature a pocket cavity in the long irons, 3 through 6, and split cavity in the shorter irons, 7 through pitching wedge. The pocket cavities, according to Nike Golf, allow for a higher trajectory so shots land softly on the greens, while the forged split cavity clubs, which look similar to blades at address, are designed for a penetrating ball flight. Nike Golf partnered with True Temper and Dynamic Gold to launch the new DG Pro shaft, featured in each VR Forged Pro Combo iron for a progressive set with various weighting, step-patterns and overall bend profiles.